There are certain phrases which are so frequently used in critical parlance that they wind up being stripped of all meaning. Chief amongst these is, "a triumph of the human spirit." On its own, it's an evocative expression of the potential for some inner, indefinable element of humanity to overcome any obstacle, yet in practice, it is used so often that it ends up becoming trite and cliche. So much so, in fact, that whenever I think of the phrase, which is admittedly not that often, it is in relation to stand-up comedian Kyle Kinane sardonically describing a story of using a bathroom in a less than reputable bar as such. In short, it's a phrase that has been robbed of its power through overly enthusiastic repetition. The one upside to this process is that when a film is a genuine, bona fide example of a triumph of the human spirit, it stands out. The phrase suddenly has new life and meaning because it finally has something worthy of being ascribed to. 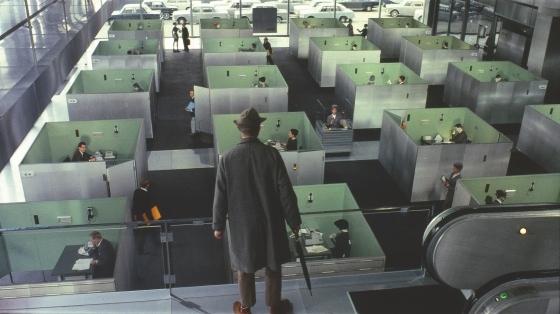 Jacques Tati's Playtime is one such rare example, and is even rarer when we consider that it is a comedy, rather than the sort of heart-rending dramas such a phrase is usually associated with. It's worth pointing out at this point that even though I think Playtime is a masterpiece, I don't care for Tati's work in general. That he was clearly a very talented actor, writer and director is undeniable, but I just don't find his work that funny. It's very charming and has a real sweetness to it, but it doesn't chime with my own sensibilities. Sense of humour is about as subjective as a critical faculty can get, so whilst I would never say that his work was completely unfunny, I also can't say that it makes me laugh. Part of the reason for this lies in Tati's signature character of Monsieur Hulot. The character is undoubtedly iconic, so much so that he is recognizable by his silhouette, but the kind of fairly gentle physical comedy on display in Monsieur Hulot's Holiday and Mon Oncle strikes me, personally, as a bit antiquated and lacking in the invention of, say, Buster Keaton, who is my preferred slapstick artist of choice. It may come as no surprise, then, that Playtime is my favourite Tati film since it features relatively little Hulot. Tati himself was tired of playing the character when he started filming Playtime in 1964 (the production of the film was legendarily troubled, taking the better part of three years to from the first day of shooting to its completion) having portrayed him for more than a decade at that point. Rather than dispense with him entirely, Tati has Hulot flit in and out of the film, occasionally being the central figure but mostly acting as a supporting figure (when he isn't wholly absent) who injects much needed chaos and disorder into the sterile environment of the film, on which more will be said in a moment. The plot of the film is picaresque and slender as it depicts a day in the life of the aforementioned Hulot (played by Tati) and a young American tourist named Barbara (Barbara Dennek). The two wander separately through an ultra-modernist nightmare vision of Paris that consists solely of grey, angular office buildings constructed with a horrifying uniformity. These buildings are so homogeneous that when Barbara looks at a series of posters showing locations around the globe, we see that it's the same exact tower just with slightly different surroundings. There's a real sense throughout of the anonymity of modern life and the way in which every city, and each person within that city, edges towards a painfully artificial conformity. 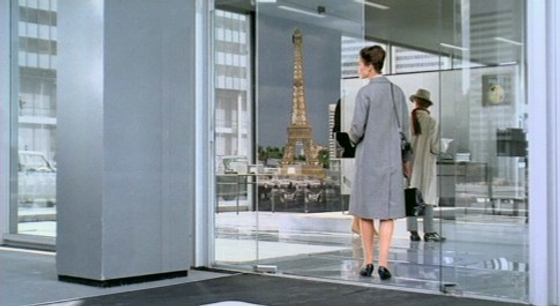 In one of the film's best and sharpest jokes, the only real indication that the film even takes place in Paris comes when Barbara happens to catch the reflection of the Eiffel Tower in a glass door. It may seem strange to harp on about the design in a comedy, if only because it plays into that old notion that if you talk about how good the cinematography is in a film then the story probably isn't very good, but here design underpins intent. Whilst several of Tati's other films (most notably Mon Oncle) satirise aspects of modern life, Playtime goes one step further by depicting an ever so heightened version of reality in which all the perfectly straight edges of human architecture start to impact upon human behaviour. With the exceptions of Hulot, Barbara and a handful of others, every character in the film walks in perfectly, unnaturally straight lines that mirror their surroundings and have most of their natural urges suppressed by their environments. 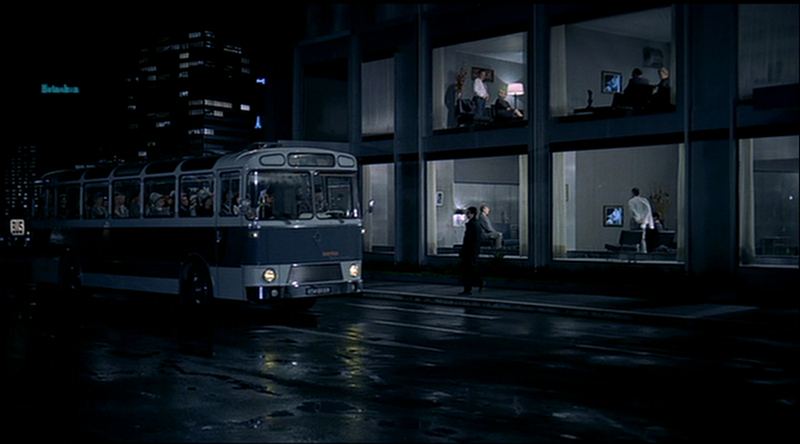 Many of the characters travel in large groups, often moving in a single direction with little deviation, and as one of the only characters who breaks away from these groups, Hulot spends most of the first half of the film getting lost in a succession of identical office buildings. His befuddlement is funny, but there's also something cold and inhuman about it all. Pretty much every location in the film was built especially for the production, creating a gargantuan set known affectionately as 'Tativille.' The care and attention on display throughout the film is phenomenal. Tati and his team created a perfect example of a faceless, identikit world in which everything and everyone looks and acts the same, and the film is closer in spirit to Fritz Lang's Metropolis than it is most other comedies. (Both films were, after all, inspired in part by their creators visiting America and witnessing this sort of stark architecture first hand.) It's an attitude that extends to the colour palette, which for the most part consists almost solely of different shades of grey, intended to create the effect of a black-and-white film whilst still being in colour. Any burst of colour then leaps off the screen, breaking the grim hold of the purposely limited selection. Interestingly the use of colour doesn't always serve to alleviate the sense of alienation that runs throughout the film, but more often than not heightens it. For example, one of the more colourful moments comes when Hulot stands dejectedly eating at a pharmacy whilst he and the other patrons are illuminated by the harsh green light of a neon sign. Like much of the film, it's a moment that is funny and sad, and which also highlights the way in which different aspects of modern life serve to stop people acting like real human beings. Even the dull buzz of a neon sign can reduce people to silent consumers bereft of vigour. The moments that brighten things up, tonally if not visually, come from instances of real human interaction, which almost all come from Hulot's coincidental meetings with old friends. Again, Tati makes a connection between the past and a less regimented time. (Which is ironic considering that all his friends are people he served in the Army with, which is kind of the height of regimentation.) Even these moments play out against the thrum of modernity since one of Hulot's friends invites him back to his apartment, which is closer to a display window in a department store than somewhere people might actually want to live. Once again, Tati shows how something as warm as spending time at a friend's home can be isolating and sterile when viewed through a too-modern lens. Despite the almost oppressive sense that modern society is a sort of crushing weight upon the soul, Tati offers some considerable hope when he shows that, for all its disquieting and dissociative effects, this kind of conformity is not all-powerful, but can fall apart very easily. In a sequence that takes up much of the second half of the film, Hulot, Barbara and a host of other minor characters they encountered along the way arrive at a restaurant. It happens to be the restaurant's opening night, and things are not going well. The kitchen can't keep up with orders, the building work has not been finished and the lights keep failing. Out of chaos comes joy. The clientele, after initially being stuck up and snooty about everything, begin to loosen up, cast off their inhibitions and start drinking, dancing and having fun. In short, they start acting like normal people. It's a really heartwarming sequence because it reaffirms that there is something beautiful at the core of humanity that can transcend the humdrum of the everyday and the strict dullness of our architecture. I mentioned at the start of this essay that Playtime is a film about the triumph of the human spirit and it truly is. Not because it is about a triumph of a single great adversity, but because it shows that the seemingly unshakeable oppressiveness of modern cities is actually just a smokescreen that obscures true humanity.